Cissampelos sympodialis is a plant in northeastern Brazil used by the populace for treating respiratory diseases. Several studies have shown that ethanol leaf extracts have immunomodulatory and anti-inflammatory activities. Infusions are widely used, popular, and an ancient technique in traditional medicine, using hot water alone as the means of extraction. This study aimed to investigate acute toxicological potential of leaf infusions of Cissampelos sympodialis, when applied orally at a dose of 2000mg/kg to Rattus norvegicus, combined with an in silico study of 117 alkaloids present in the Cissampelos genus; five (5) of which were determined to have high toxicity (21, 8, 93, 32 and 88), and five (5) having both low toxicity (57, 77, 28, 25 and 67) and low liver metabolism. The in vivo toxicological evaluation showed that male water consumption decreased, and the feed intake decreased in both sexes. Yet, the figures as to change in weight gain of the animals were not statistically sufficient. As for the biochemical parameters, there was an increase in urea, and decreases in uric acid and AST in males. In females, there was a decrease in albumin and globulin which consequently leads to a total protein decrease. Despite biochemical changes suggestive of kidney damage, the histological sections revealed no kidney or liver changes. The results therefore indicate that despite presenting alkaloids which may be toxic, the genus Cissampelos, or leaf infusions of Cissampelos sympodialis, when applied orally at a dose of 2000mg/kg present low toxicity. Keywords: Cissampelos sympodialis, acute toxicity, in silico, in vivo, infuse, Metasite, histopathological. Keywords:Cissampelos sympodialis, acute toxicity, in silico, in vivo, infuse, Metasite, histopathological. Abstract:Cissampelos sympodialis is a plant in northeastern Brazil used by the populace for treating respiratory diseases. Several studies have shown that ethanol leaf extracts have immunomodulatory and anti-inflammatory activities. Infusions are widely used, popular, and an ancient technique in traditional medicine, using hot water alone as the means of extraction. This study aimed to investigate acute toxicological potential of leaf infusions of Cissampelos sympodialis, when applied orally at a dose of 2000mg/kg to Rattus norvegicus, combined with an in silico study of 117 alkaloids present in the Cissampelos genus; five (5) of which were determined to have high toxicity (21, 8, 93, 32 and 88), and five (5) having both low toxicity (57, 77, 28, 25 and 67) and low liver metabolism. The in vivo toxicological evaluation showed that male water consumption decreased, and the feed intake decreased in both sexes. Yet, the figures as to change in weight gain of the animals were not statistically sufficient. As for the biochemical parameters, there was an increase in urea, and decreases in uric acid and AST in males. In females, there was a decrease in albumin and globulin which consequently leads to a total protein decrease. 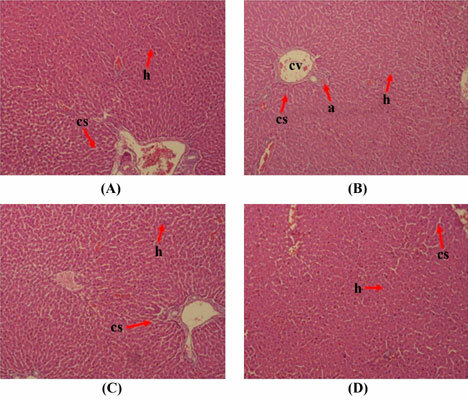 Despite biochemical changes suggestive of kidney damage, the histological sections revealed no kidney or liver changes. The results therefore indicate that despite presenting alkaloids which may be toxic, the genus Cissampelos, or leaf infusions of Cissampelos sympodialis, when applied orally at a dose of 2000mg/kg present low toxicity.